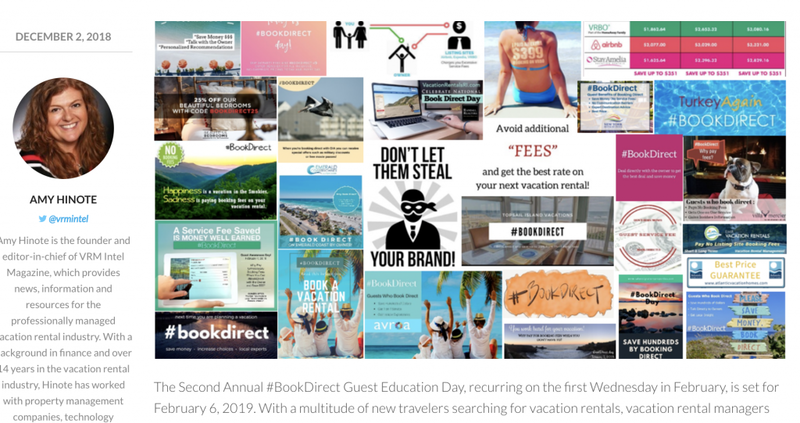 Are you Ready For #BookDirect Day – Guest Education Day on 6th February 2019? On the 6th February 2019, hospitality owners from all over the world come together to promote why people should book directly with the property and not via a Third Party websites such as the Booking Holidays, Expedia Group or Airbnb. The day is called #Bookdirect Day. Note: Scroll to the bottom of this blog to get access to four free videos that you can use on your social media channels right now to spread the word. 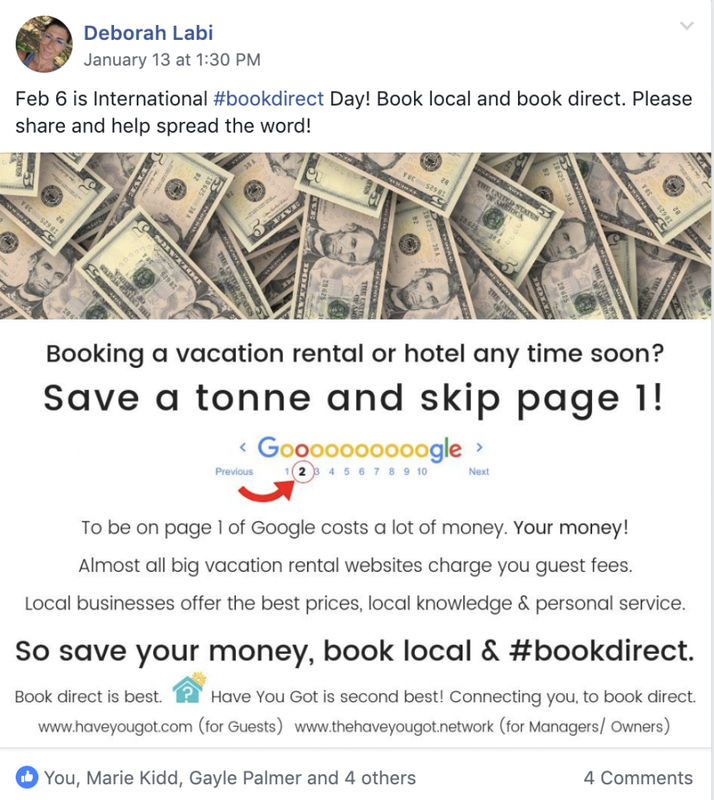 * Use the hashtag #bookdirect on Twitter, Facebook, Instagram, and LinkedIn to bring attention to the many advantages of booking vacation rentals directly with the manager or homeowner instead of on third-party channels. * Send out an email campaign to their past and prospective guests with a message about the value of booking direct, booking local, and booking smart. * Work with local and feeder-market media sources to educate consumers about the best ways to book a vacation rental. * Encourage local destination marketing organisations (i.e. CVBs, chambers, state tourism organisations) to join in promoting their direct connections to lodging providers. Deborah Lani from TheHaveYouGot.network website shared this post in the Hospitality Community Facebook Group with what she is posting around the social media networks to spread awareness. * Two online travel giants (Booking Holidays Group and Expedia) dominate the marketplace with an estimated combined market share of 95%. 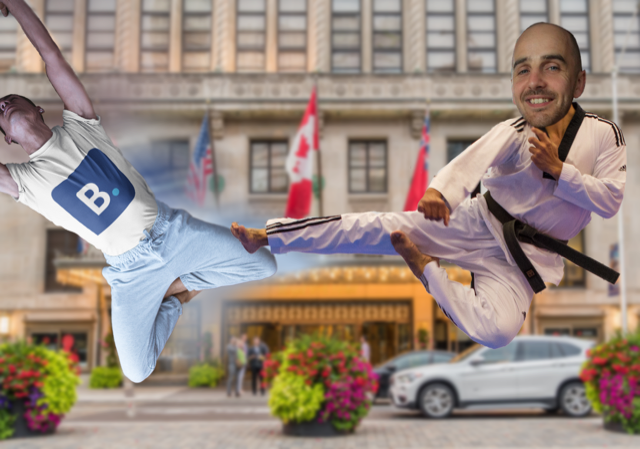 Hoteliers cannot compete with their advertising scale and are locked into costly distribution agreements, with a commission on bookings sometimes reaching 25% (or even higher). Contrary to popular belief, OTAs and aggregator sites (such as Airbnb, Booking.com, Expedia etc.) don’t actually provide the best price for travellers. Guests can save hundreds on commissions by booking direct and booking locally. When travellers communicate directly with the owner or manager, they will be the first to find out about special offers, discounts or exclusive deals. I wanted to add my contribution to help spread the word about a compelling message. That is why I went away and created FOUR powerful videos that you can use for your social media channels at NO charge. To access your videos, click on a link above and click on the download box – Direct download. Then you will be able to upload directly to your social media channel of choice. All I ask is that you tag in @boostlyuk and use the hashtag #BookDirect when you do so I can see these videos In action, then email mark@boostly.co.uk when you have any direct bookings as a result.